The Necessary Evil Press edition of THE TURTLE BOY, with cover artwork by Caniglia. 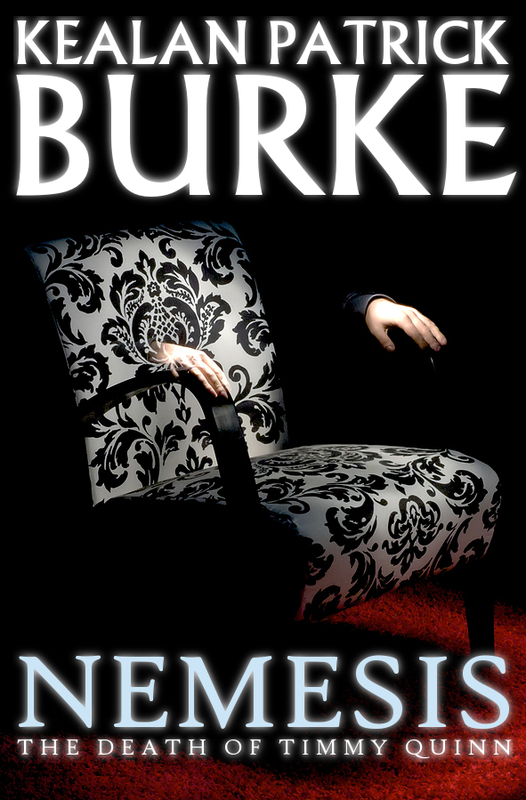 In October 2012, Kealan Patrick Burke and Thunderstorm Books will release Nemesis: The Death of Timmy Quinn, the fifth and concluding chapter in the Timmy Quinn series. As a fan of these stories from the beginning I wanted to commemorate this endgame in some way, so I invited Kealan to take part in a series of interviews, one based on each of the Timmy Quinn books, leading up to the final book’s release. We begin that series today with a look back at the one that started it all, the winner of the 2004 Bram Stoker Award for Best Long Fiction, The Turtle Boy. OC: What was the inspiration for The Turtle Boy? 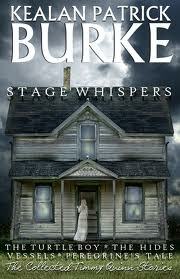 KPB: When I wrote The Turtle Boy, I was living in an old rambling farmhouse in Delaware, Ohio. Eager to write, but short on inspiration, I found myself looking out my office window at my stepson and his best friend standing at the threshold to the neighboring field. They were discussing the potential for adventure now that summer vacation had started. They eventually decided to explore the pond, which was some distance away and all but hidden from view by a cluster of pines. Suitably inspired, I started with this scene and the rest came easy, particularly as my neighbor at the time had told me the pond contained turtles the size of Buicks and that one of them had ripped off a hunk of his finger. Are there stories or characters from other authors that influenced this book (or the series as a whole)? Being from Ireland, did you work any Irish folklore into the story? I’m a big fan of coming-of-age stories like Boy’s Life by Robert McCammon, “The Body” by Stephen King, Summer of Night by Dan Simmons, and Something Wicked This Way Comes by Ray Bradbury. Even To Kill a Mockingbird was an influence. If I hadn’t read all of these books, I wouldn’t have been able to write The Turtle Boy. I wouldn’t say there’s much Irish folklore in The Turtle Boy, but there’s definitely an Irish flavor to the later books, most significantly in The Hides and Vessels, and not just because they use the country as the setting. Our attachment to and the influence of history comes into play in The Hides, and Vessels incorporates as a subtext the erosion of faith in the Catholic Church and religion as a whole. While these are not inherently Irish subjects, they’re definitely prevalent ones. How much of you exists in the character of Timmy Quinn? In the first book, there’s more of my stepson in Timmy than anyone else, but as the books go on and the conflict with his father comes into play, I think there’s a lot of me in there. As has been pointed out elsewhere, the theme of paternal estrangement seems to be a running one throughout the books. Although I wasn’t conscious of this when I wrote them, I am now, and given my own relationship with my father, it makes a lot of sense. And that’s what Timmy tries to do throughout the series: try to make sense of all that’s gone wrong in his life. When did you begin writing the book, and how long/how many drafts did it take? I started it in the summer of 2003, and it took about two weeks to write the first draft. Then I sent it around to some people for advice, among them Norman Partridge and F. Paul Wilson. Both of them gave me extensive notes and suggestions, almost all of which I incorporated. By the time it went to press, I’d rewritten it more times than I’ve ever rewritten anything since. It went through about twenty drafts before I was happy with it. Were you thinking of this as a series at the time? It doesn’t read like a deliberate segue into a series, although you could easily see the potential for the story to continue. No, contrary to popular belief (and a substantial amount of reviews that imply I ended it on a cliffhanger to get people to buy the rest of the series), The Turtle Boy was not written with a sequel in mind. It wasn’t until a year after the book had been released that Rich Chizmar at Cemetery Dance expressed interest in something in a similar vein. After I gave it some thought, I found myself curious about where Tim and Kim et al might be if we revisited them a few years down the road. I also hadn’t set very much of my writing in Ireland at the time, and it presented me with a great opportunity to do that very thing. The notion of populating my hometown with ghosts was irresistible. How has the overall story evolved as you’ve continued writing about Timmy? As soon as I realized it was going to be a series (right about the time the idea for Vessels sprung full formed into my brain), I assumed it was always going to be a ghost story. And while it is, for the most part, Vessels sets up some curve balls and Nemesis turns the tables in a most unexpected fashion. I also didn’t realize it was going to have an apocalyptic flavor by the end. 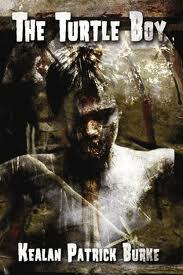 So yes, the journey has been filled with unexpected twists and turns, but Nemesis is the mother of them all. What else had you published when The Turtle Boy was released? My first collection, Ravenous Ghosts, had just been released, and I’d had a number of short stories published in various venues, but The Turtle Boy was the most significant release to that point. How big of an impact did its success have on your career? Oddly enough, it didn’t do much for me at the time, not that I really expected it to, but it has done a lot in the past few years, more than I’d ever have imagined, in fact. Thanks to a new lease on life as a digital release, the success of it and the other books in the series has allowed me to return to writing full-time after a few years spent floundering in the doldrums. Caniglia’s art was such an amazing addition to that first Necessary Evil Press edition of the book – especially that cover, which pops into my head whenever I think of this series. How much did his art add to the package in your eyes? I absolutely adore that cover. With that image, and the interiors he did for the book, I think Jason completely nailed the spirit of the book. I remember the first time I saw them, my breath literally caught in my throat. With only minimal input from me, it looked as if he’d actually visited the real-life pond that inspired the story. It was uncanny. And I think his work elevated the book from just another small press title to a work of art, more due to his illustrations than my story. Among your books, where does The Turtle Boy rank in your eyes? How about within the Timmy Quinn series itself? Because of all it’s done for me over the years, The Turtle Boy is my favorite book. I’m not overstating things when I say it has given me my career. But overall, I think my best book to date is Kin for its maturity and cohesiveness. In terms of its rank within the series, I would rank The Turtle Boy lowest because I wrote it in my early twenties and had not yet found my proper voice. So I think every book in the series benefited from the age I was when I wrote it. To that end, I would rank Vessels and Nemesis as the strongest entries. I’m fond of them all for different reasons though. Would you ever consider taking a second stab at The Turtle Boy, like Stephen King did with the first Dark Tower book? If so, what would you do differently? That’s a superb question, and man, have I been tempted. The advent of digital publishing means I can revise at any time if I wish. And I do wish, if only to smooth out some of the clunkier parts, and reduce the block of exposition toward the end. Maybe even nix that cliffhanger ending so many readers find so troublesome. But I can’t. Don’t ask me why. Something stays my hand every time I get close. Maybe I’m just too proud of it, flaws and all, to want to fiddle with it. It’d be like if I took one of my childhood pictures and photoshopped out my buck teeth. Sure, I might look less goofy, but it wouldn’t be an accurate depiction of who I was at the time. Nemesis will be available as a signed, limited edition hardcover from Thunderstorm Books. Thunderstorm is also prepping a deluxe edition of Stage Whispers: The Collected Timmy Quinn Stories that will include Nemesis, which is not included in the current digital edition. Visit Thunderstorm Books for more information. This entry was posted in Books, Fiction, Horror, Interviews, Recommended Reading and tagged Horror Fiction, Kealan Patrick Burke, The Turtle Boy, Thunderstorm Books, Timmy Quinn. Bookmark the permalink. In the first part of a five-part series on the Timmy Quinn books, critic and fellow writer Blue Gilliand interviews me about THE TURTLE BOY on his blog, THE OCTOBER COUNTRY. Check it out! Looking forward to the other interviews. Interesting read!